In the cutting out process I cut the facing fronts, which form the upper collar, 3mm wider along that front edge. I wanted to use a tailoring technique that helps to ensure the seam stays underneath. 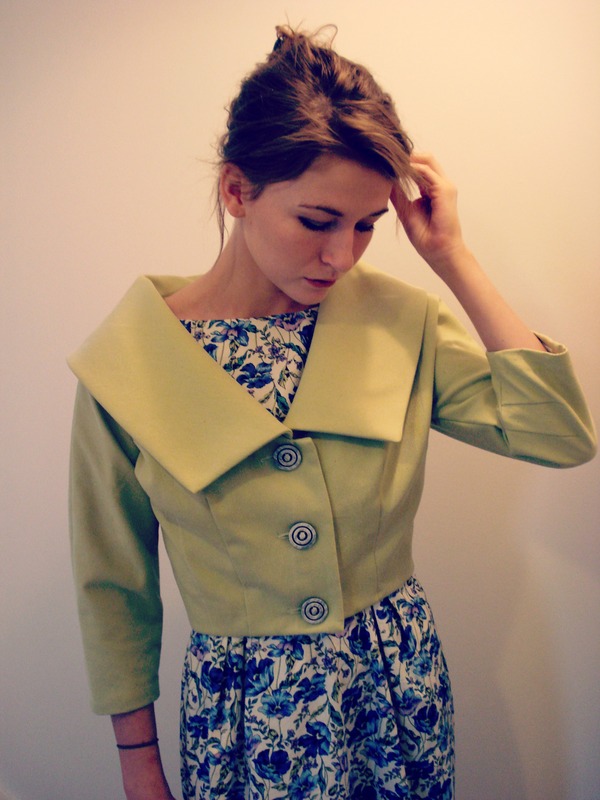 I did the same on the lower edges of the “peplum” pieces & the front edge. It really did help, as well as a lot of steam & flattening with my clapper! 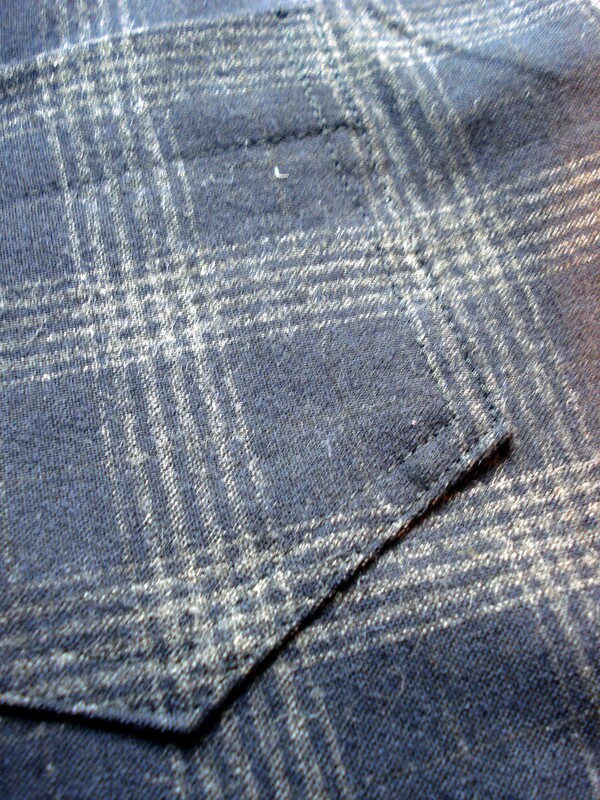 I also lengthened the shoulder seam by 2cm & the sleeve is 6cm longer. I cut the back lining piece with a 2cm pleat in the centre, this to enable movement, but otherwise kept everything else as standard. I even stayed with the bagged lining instruction! This really is an easy pattern to make. 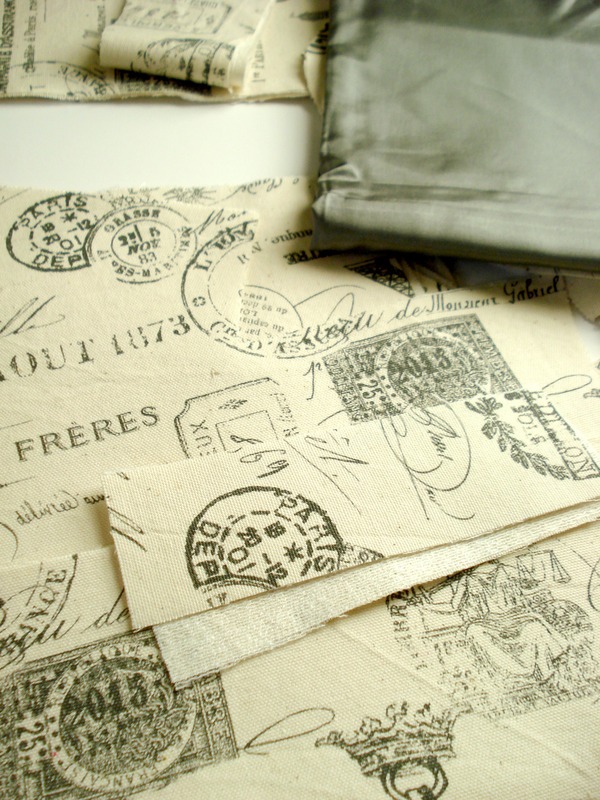 The pockets are in-seam & the instructions are so plain & simple, a novice should be able to follow them with no problem! I found no problems, apart from the front sleevehead:armhole ratio. There is more armhole than sleeve! I must alter this on my traced pattern, but for now I managed to ease it all in & it doesn’t look like there was a problem. I need a bit more pressing on that front edge! We are on the lookout for a buckle or something for the front closure, we sort of decided we’d like an edge to edge closure, rather than a button. For now though, she’s happy to wear it as it is, & her friends have been suitably impressed with it! It got its first outing to school on Tuesday morning & in double French the teacher was most impressed with the fabric choice! I’ve shown the pattern & a suitable piece of fabric to Daughter No1 too, fingers crossed she likes the combination & I can make another! In Jungle news, I spent many fruitless hours searching for my bodice block & toiles from last year, finally located them, only to realise I’d eaten too much over Christmas (and any other time in between) & needed to re-draft anyway! Grrr. So that’s what I did yesterday, & I’m intending to move along with adding the style lines & creating my puuuurfect jungle blouse. A very pleased youngster with 2 new jackets in 3 days! How are your jungle plans? 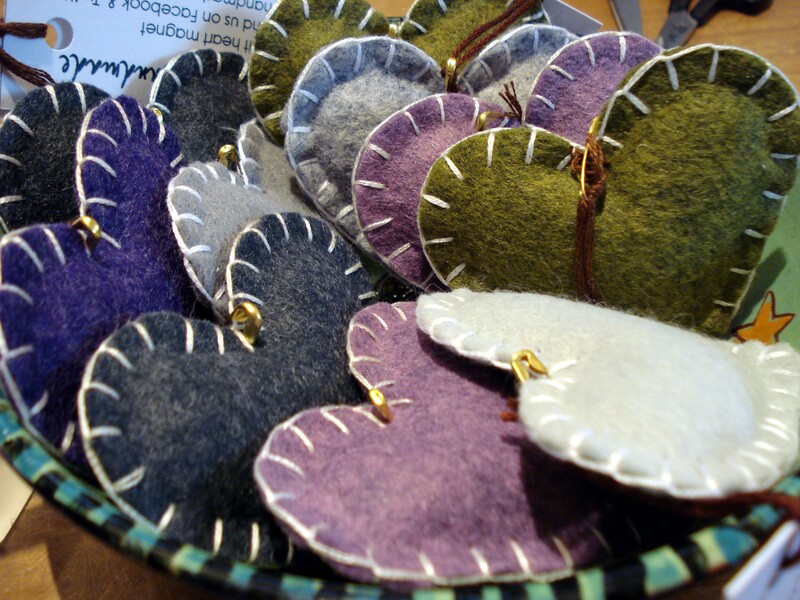 And have you taken advantage of the special offer at Raquel Gonzalez‘ Etsy store? You only have until this Monday to get 15%off a purchase over $50, and free shipping, so get cracking! Use the code: NewYearNewPurse when you check out. 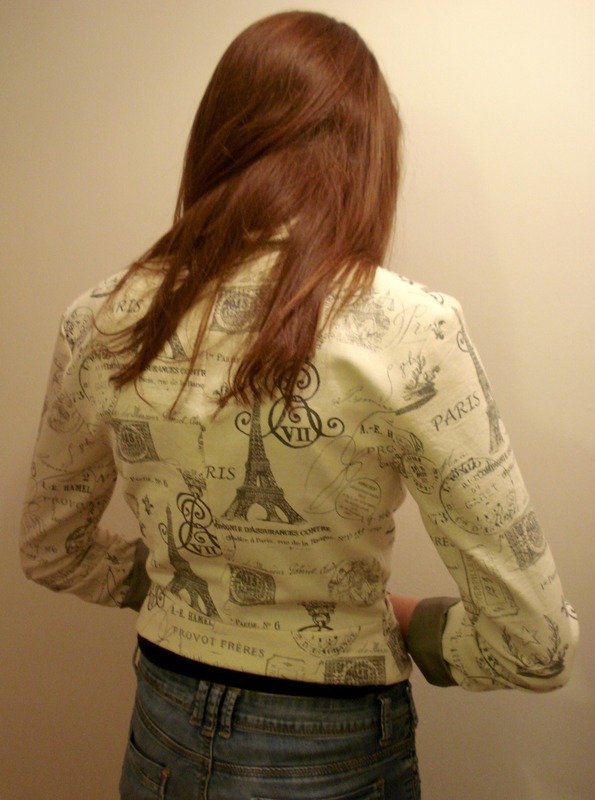 It’s a cotton canvas with a French print, writing & Eiffel towers all over. I cut it out yesterday & raided the stash lining box again. 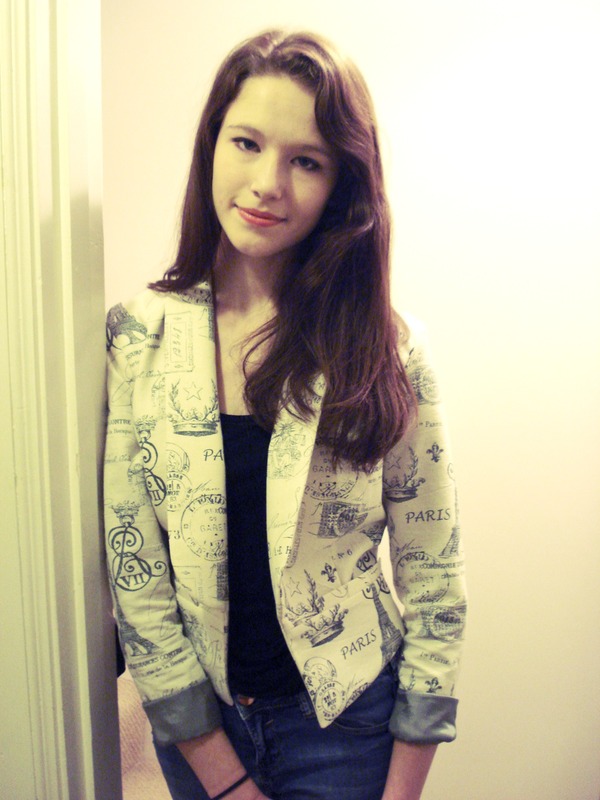 There was enough of a silver/grey/lilac that I’d used for a vintage jacket. Again, praise for the small pattern pieces! 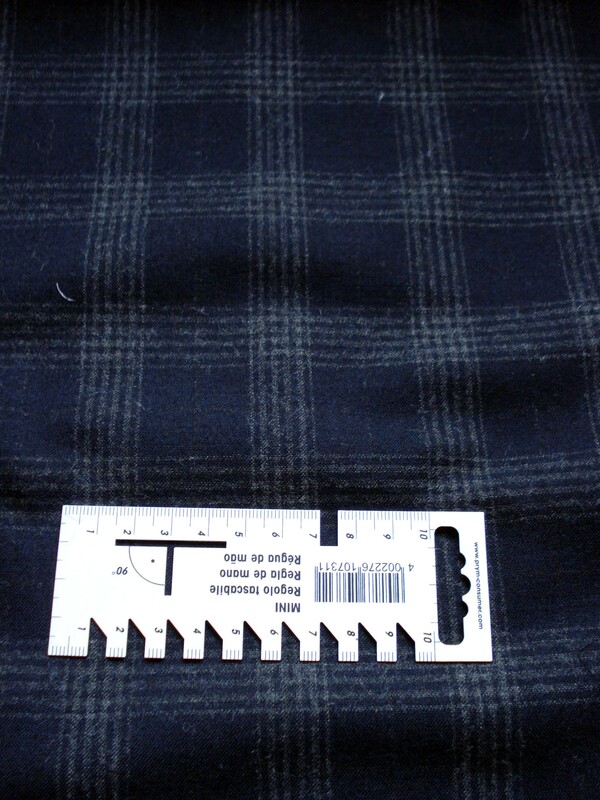 I have added a movement pleat in the back lining piece. This cotton canvas had a degree of movement in it & I don’t want to be fixing ripped armhole seams in the lining after a couple of wears. I managed to interface the fabric in the 30 minutes before Sherlock started last night, so today I’m ready to hit the ground running! YAY! I was asked by a local store to make them some bunting (who else wants winter over now already? ), so I again resorted to the stash. 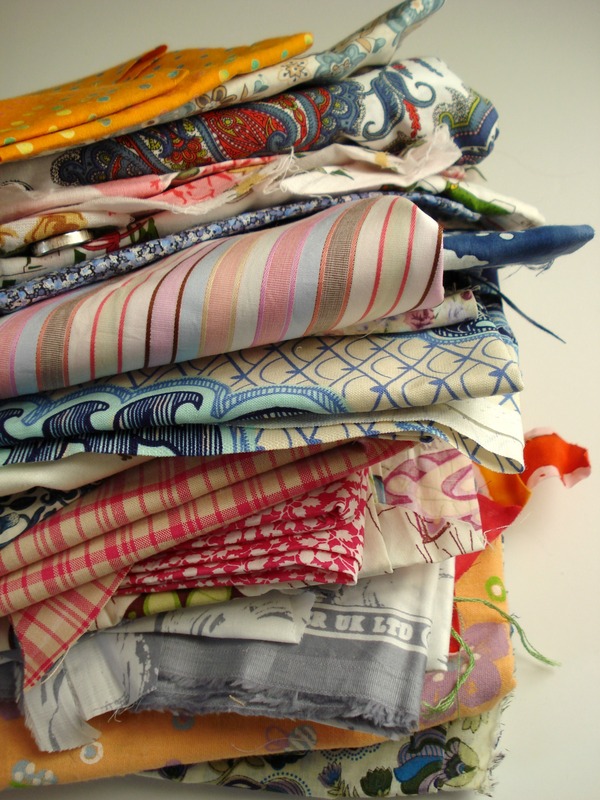 Funny how many pieces of left-over fabrics there are in my cupboard! Anyhow, I yanked out a pile of pretty stuff, a lot of which are Liberty lawn, so this is going to be high-class bunting!! I also re-measured husband for his pattern cut shirt. Thank goodness I did! In the 3 years since I decided to make him a handmade shirt (or 2) he’s got a teeny bit bigger! 🙂 We both have to be honest, and he’s not been that bad. Anyhow, so that’s another thing to start, in addition to the Jungle blouse for me. 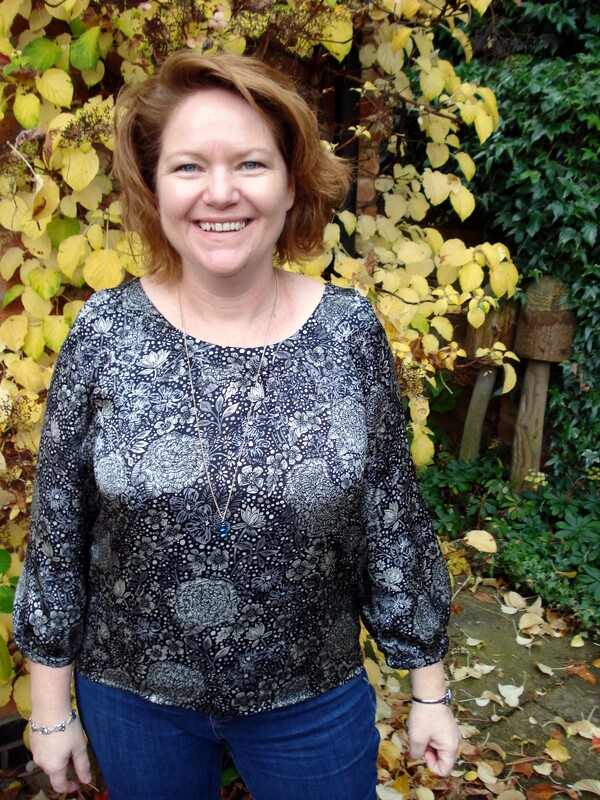 As well as rambling on about my progress this weekend, I have a special offer for the readers of this blog. There are so many talented people plying their crafts on Etsy, but here’s one person who makes the most amazing handbags & totes. Seriously, I have spent far too much time on her page, drooling over the colours & styles & being absolutely hopeless in my decision making. However, as it’s the New Year & we all need a boost – and a new handbag – Raquel Gonzalez is offering you guys 15% off any purchase over $50 (that’s US Dollars), including free postage. The discount is valid until Monday 20th January, so don’t dither too long over making a decision! Use the code: NewYearNewPurse when you check out. As for me, I cannot decide between this floral tote (perfect for stashing fabric shopping in, yes??) & this block colour turquoise one. I wonder how much fabric one could stuff into one of these…. Then again, if I wasn’t worried about hiding fabric, I could totally have this purple crocodile number – drool!! Yup, you read that correctly! 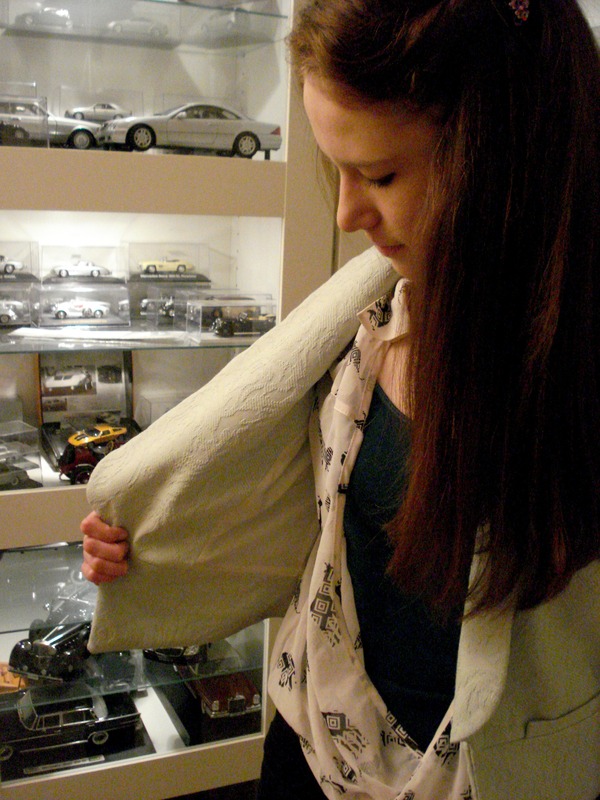 This jacket has been made using a curtain – let me explain. 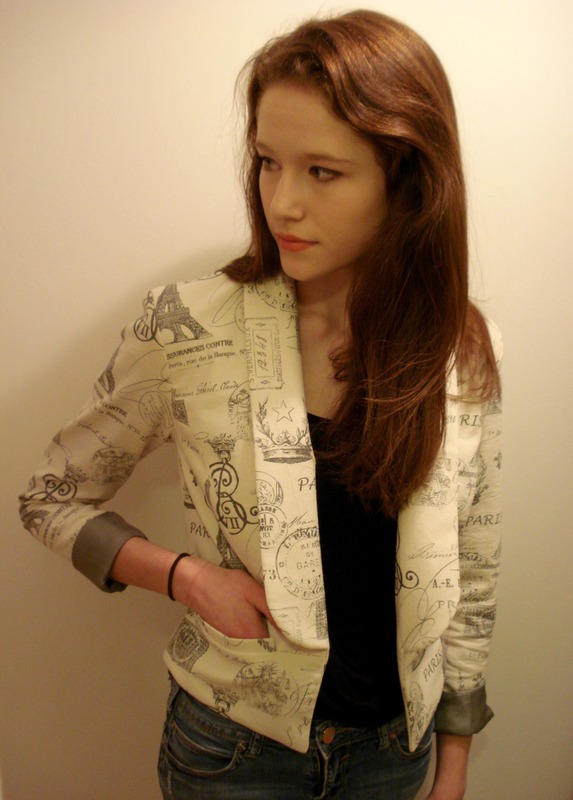 I won the Papercut Patterns Bellatrix Blazer in Kat‘s giveaway last year. I had a pretty good idea it would look pretty fabulous on the Daughters, and I especially liked the cropped version. Thankfully I have a lightbox, because I needed it to trace the pattern! For this first go I was going completely by the book & Daughter No2’s measurements. With a new pattern I like to keep it simple and see where I need to alter, & I like to do the whole thing according to the instructions, so I can decided where I’d do things differently. On the whole, the pattern went together really well. One thing I don’t like is a bagged lining, so that’s definitely going to be changed when I make the “real thing”. I will also be lengthening the sleeve by about 8cm (Daughter No2 has orangutang arms). But before she gets another blazer, I need my Jungle attire! I have an Etsy shop!!!! 😀 YAY!! I finally cracked. 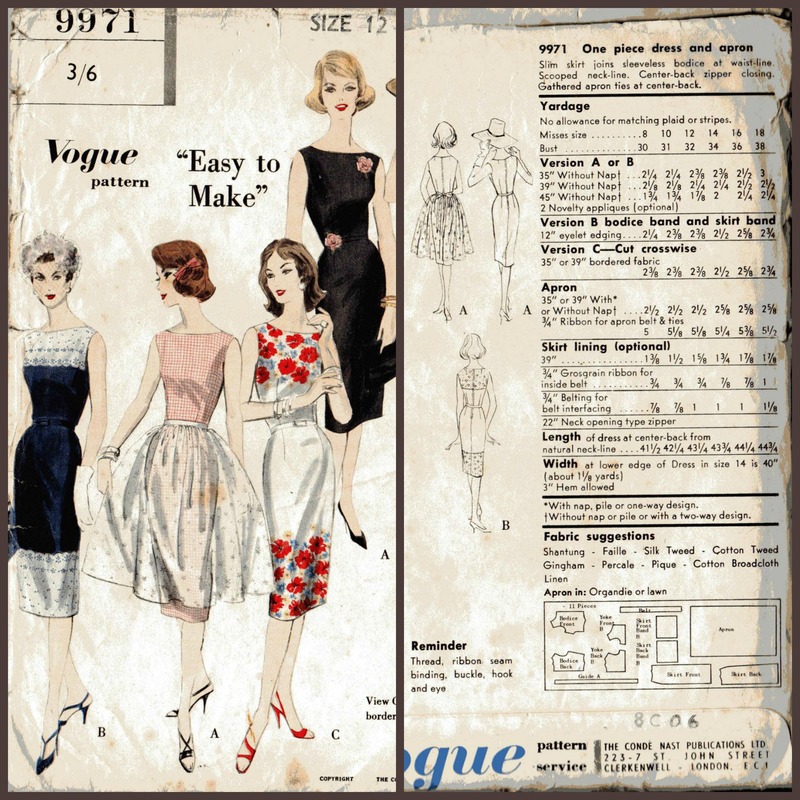 I am going to make the vintage patterns in my boxes pay for their keep, & new additions! 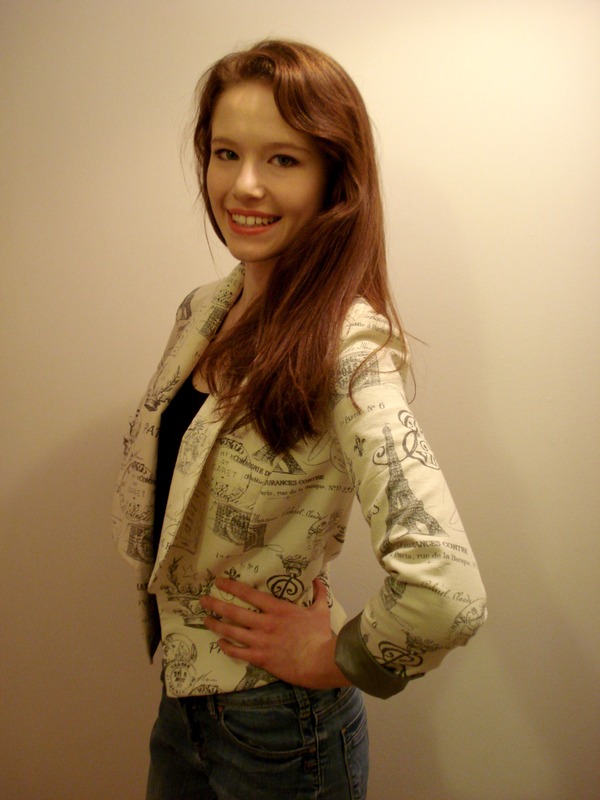 Daughter No2 & I had a chat regarding all these pretty patterns, and how elegant the fashions are/were “back in then”. It seems a shame we have lost some of that, and I love making beautiful things. 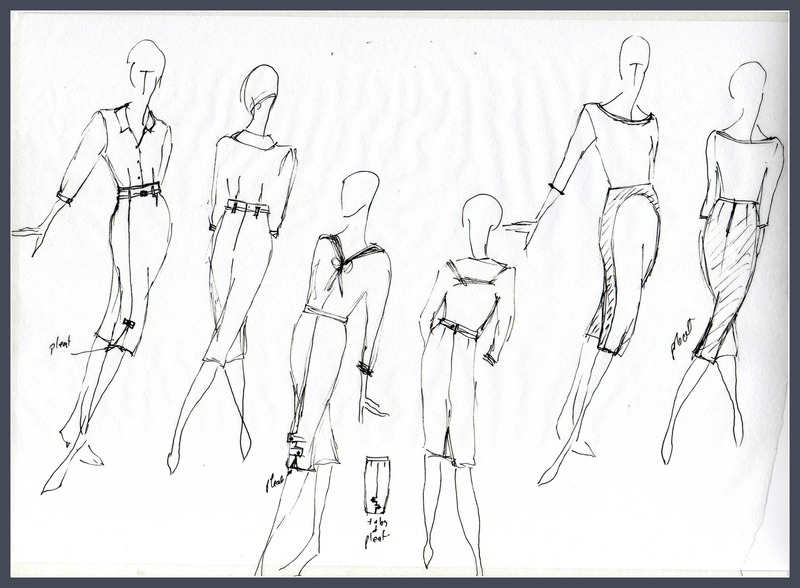 So it was decided to start making the patterns I have into clothes, making them in suitable fabrics & with the finishes they would have had if made by a seamstress when the patterns were new. 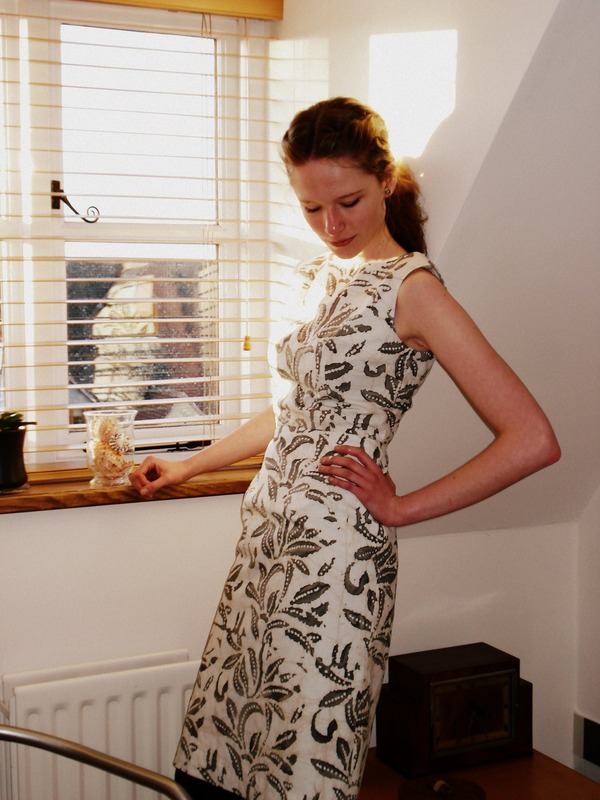 The fabric for the dress was sourced from Croft Mill, and boy do they ship quickly! 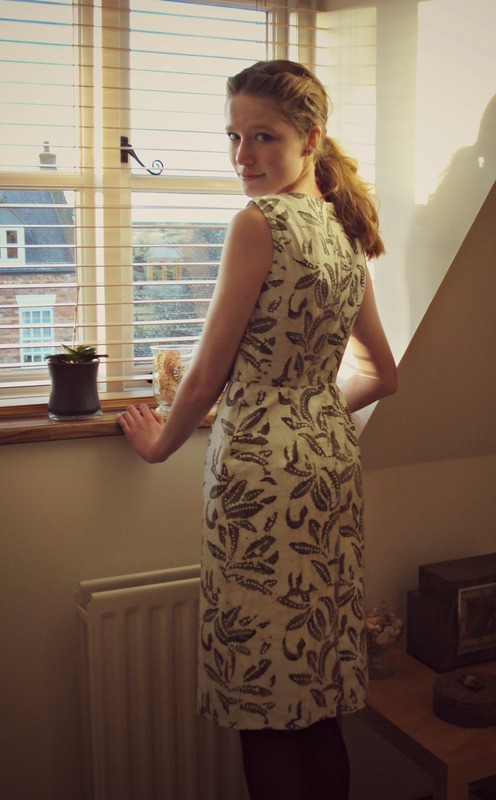 I placed the order online on the Thursday night, by Saturday lunchtime it and the order made on Friday morning from Ditto Fabrics had arrived! This green pistachio cotton drill is fabulous! Ditto also have it in a dusky pink, I may just have to have some! I do have some projects to add here, but they can wait for another post….. Other good news is that no-one coming to view our house has been injured due to a fabric avalanche accident. Yet. Oh – aaannnddd – the dream house that was snatched from under our noses is back on the market! The buyers pulled out at the last minute, so now all we need is to sell this one! Anyone for a 3 bedroom townhouse in a rural market town in Warwickshire???? 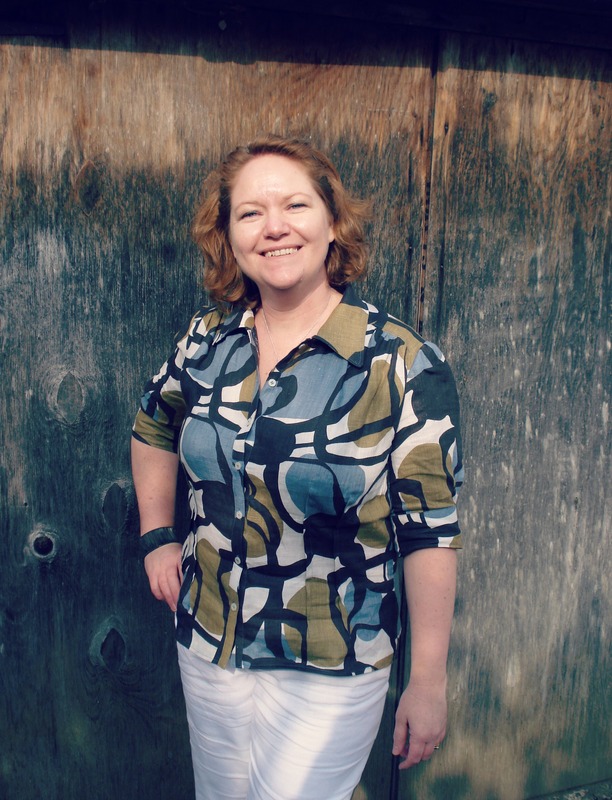 Author Anne WPosted on 02/07/2013 Categories Commercial patternsTags 1950's, butterick pattern, croft mill, ditto fabrics, etsy shop, sheath dress, vintage dress, vintage jacket21 Comments on Breaking News…..
Well I certainly didn’t expect a whole month to go by before I got back here! And what a month it has been. I had a trip to hospital (won’t go into details), we found our dream home, we put our current home on the market in order to get said dream home, only to have it snatched from underneath our feet days after putting our house out there. So now my days are filled with making sure everything is neat and clean and tidy and there is no sewing lying around. It’s not exactly conducive to being creative. 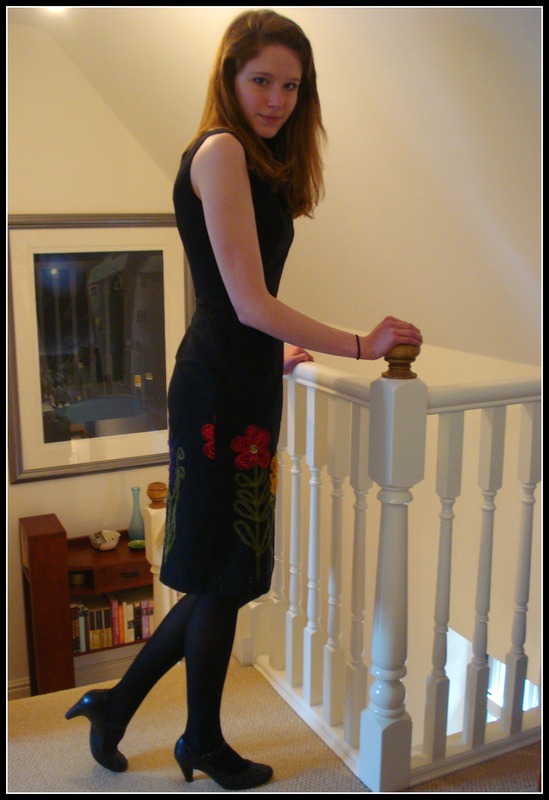 I have managed to sew up two dresses from a vintage Vogue (unprinted) pattern for daughter no 2’s 6th form wardrobe. Vintage Vogue 9971 isn’t it just devine?? I have to say I am really happy with the results, she looks amazing in these dresses! 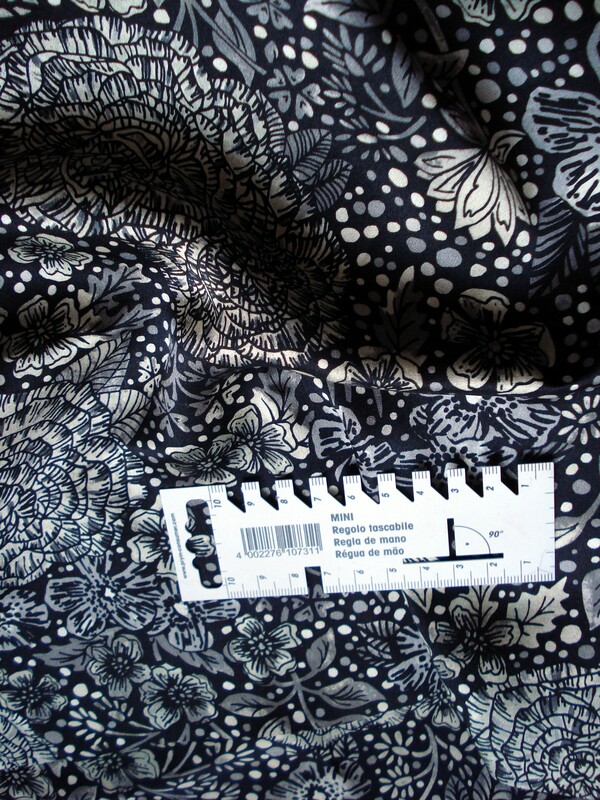 The fabric is a black cotton I bought about 5 years ago, intending to make a skirt. The organza ribbon flowers run parallel to the selvage edge. It was fun cutting this out, to make sure the repeat of the flowers was correct, being sure there was enough for the bodice, as I’d only bought just over a metre! I just didn’t get it right on this side with the flowers. She liked the fit so much we made another…. 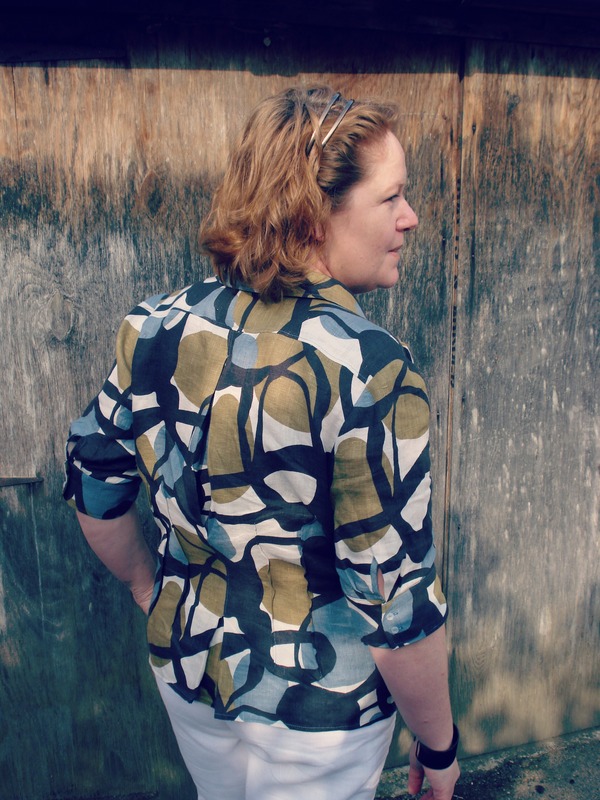 This is no stash fabric… I bought it from Fred Winter’s in Stratford at Easter time, funnily enough, with this dress in mind! After digging through the stash at the beginning of the year I had earmarked the black embroidered fabric for this pattern, and before I’d made that up I found this batik, perfect! So it was just as well Daughter No2 liked the pattern enough to have two! Phew. I have managed to use up another stash piece. 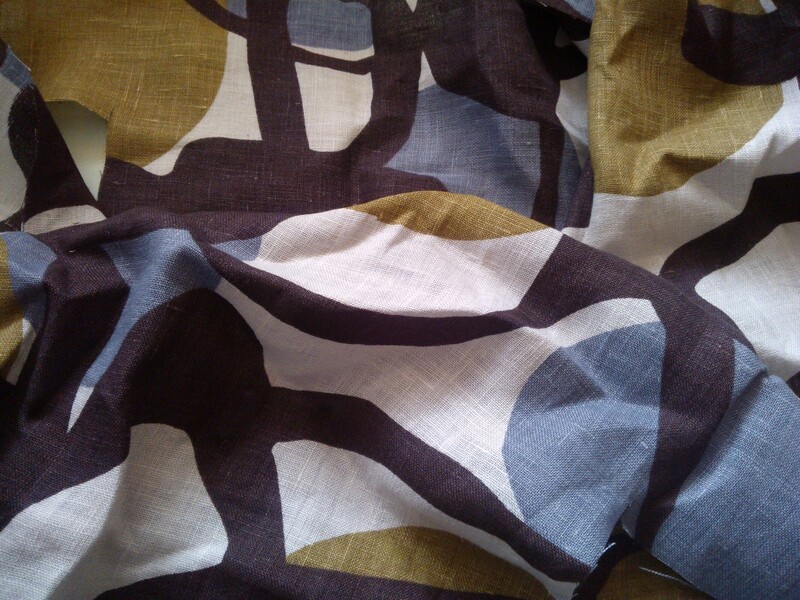 I had bought this particular linen easily 5 years ago, if not more. I loved the colours, and again thought I’d end up with a skirt. But I never got round to it, and now I know not to bother with skirts, so what to do? I couldn’t part with it. 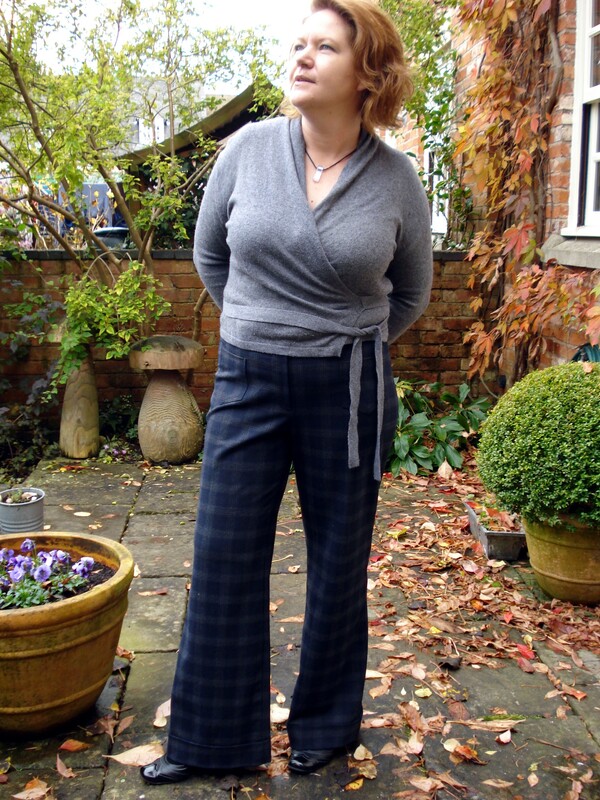 In April Kat & the Curious Kiwi came up with a Burda Sew-along idea. I figured I’d join in, it’s not like I’m short on Burdas, afterall. 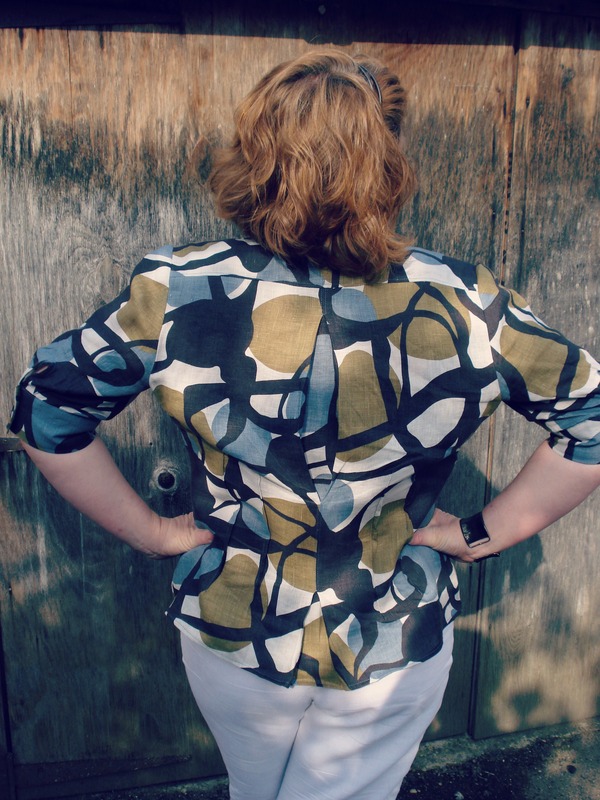 I decided to use this linen to make Blouse 107 from Burdastyle January 2011. It’s a pattern I’ve used 3 times before so I know it works, and it suits me. I have suffered from lack of ooomphf on this project, not helped at all by the whole house thing. And the weather. Spring started, then it went away again, what’s with that? 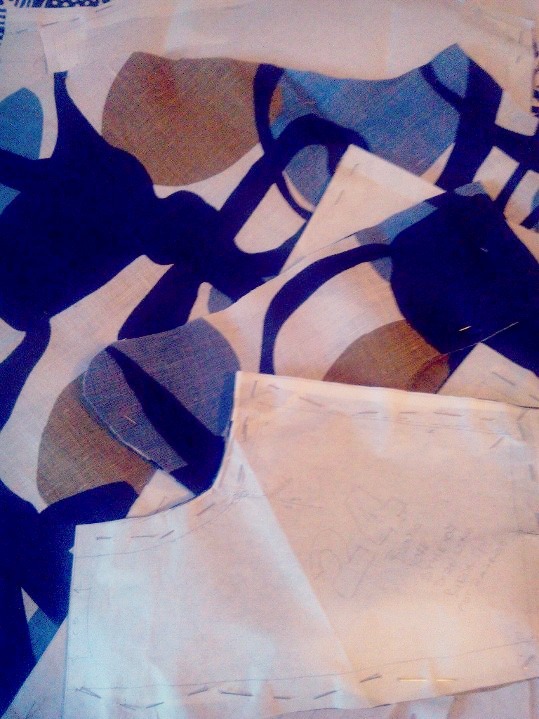 All cut out & ready to sew – apologies for the grainy quality, phone photo. I was doing well until I put the collar together. In my blissfully un-concentrating state I did the collar the “normal” way for a shirt, completely forgetting that this one does not go together like that. grrrr. It took 2 days for me to go back to it and cut another. Then it came together quite quickly. I had wanted pretty buttons but the shop only had 2 of the ones I liked, so I raided the button box & found enough Jasper Conran ones that came off one of Husband’s discards. Win win.. I like the fabric, and I like the pattern, but did I do the right thing by putting the two together?? I’m in two minds. It feels right when it’s on, but I am not sure I was in the right place when I married this fabric with this pattern. Is it too busy? 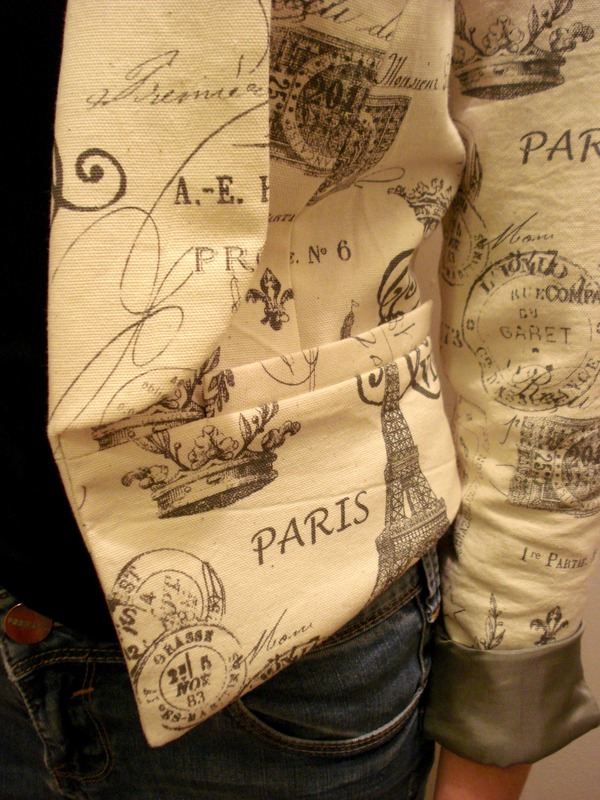 I love the sleeves on this pattern. 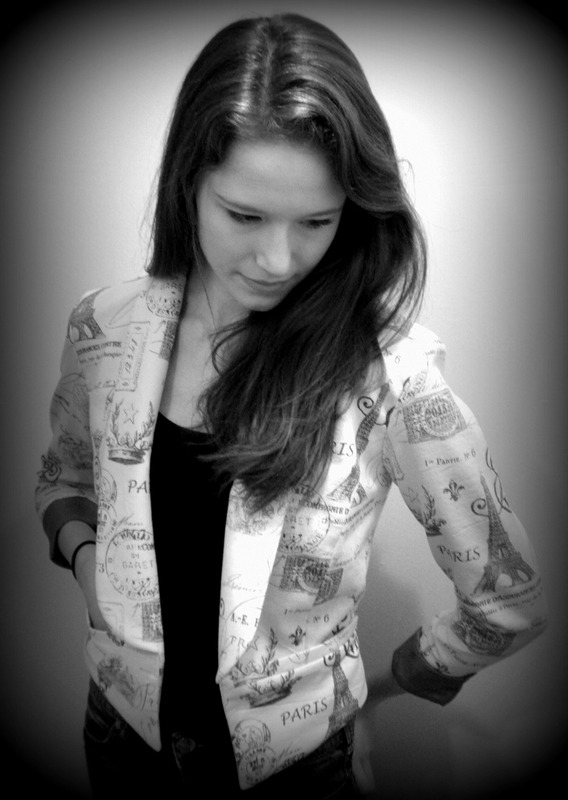 Excuse the wrinkly bits, I’d been wearing this all day waiting to take photos! In addition to the sleeves, I love the darts. There are 4 across the back, and another 4 on the front. The pattern calls for them to be sewn on the outside which makes for an interesting textural contrast, and means you get to play with a contrasting or matching thread. Of the 4 blouses I’ve made, 3 have the darts on the outside. 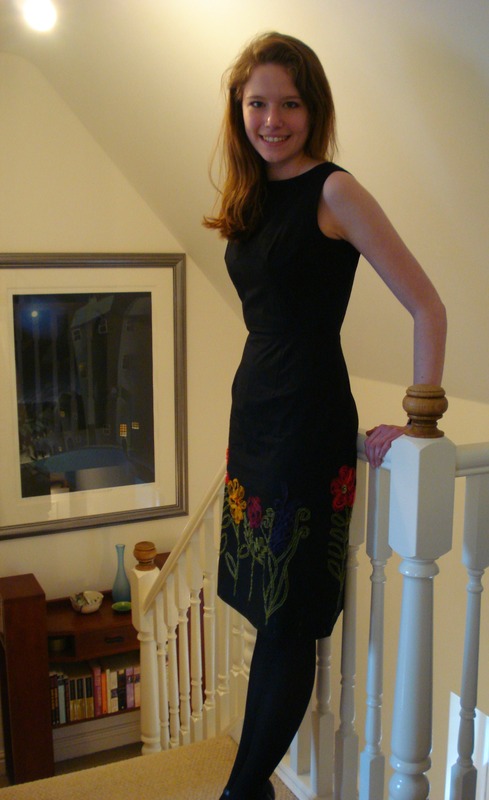 There is also this cool pleat down the centre back, stitched in at the waistline. This means there is still shape at the waist, but extra movement for flingin’ your arms around & reachin’ for stuff. The back with cool central pleat. 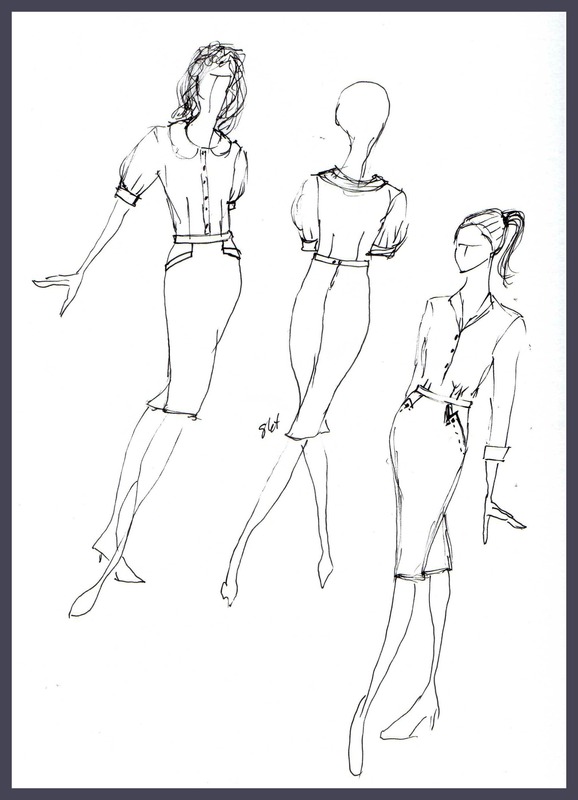 Here are some of the sketches for skirt (& shirt) ideas I’ve had for daughter no 2.